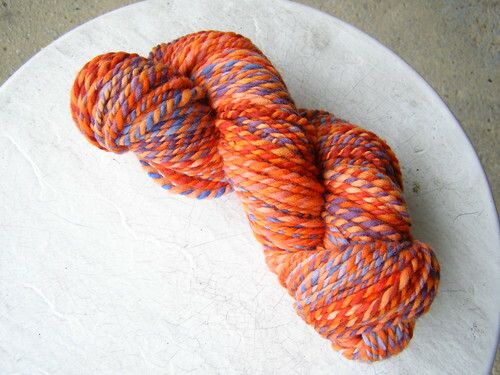 just some nice handspun for you today :) one braid of this roving is still in the shop. mine had less orange and more of the light cherry. a lighter than bulky weight subtle stripes skein – part of the reason i make these very bulky all the time is that it is easier to control getting complete stripes that way. 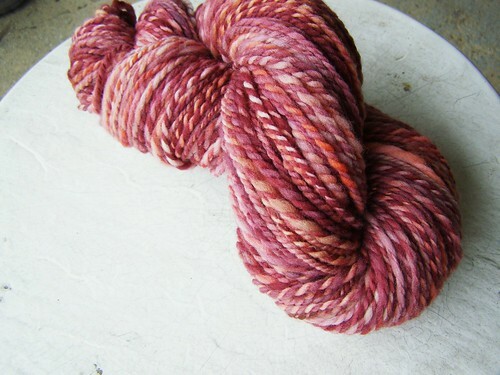 maybe i’ll start giving 1/4 oz more of the main color in the kits so that it compensates for thinner spinning. hmmm. and finally rachel and i have been into the drum carder lately… so a springy yellow yarn made from misc wool – including falkland, scraps from a batt i bought from someone else, and mill ends. 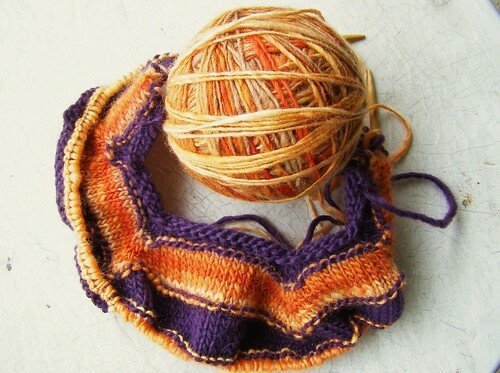 i’ve also started knitting with some handspun before i could take a photo (ahem). this roving. the knitting is the up-sizing of the baby beau. P.S. if you’re in the pgh area – i’m teaching drop spindling through the calliope school for folk music. you can check it out here. 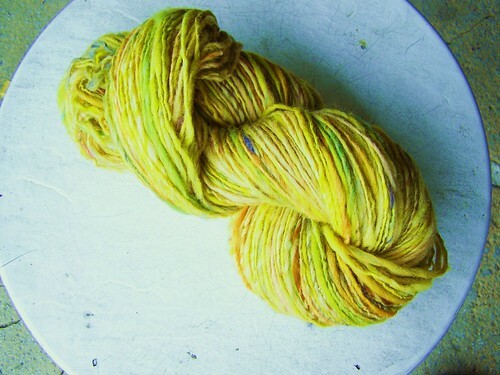 This entry was posted in cosyknitsliterally, cosyspins, handspun, knitting, spinning, teaching by cosymakes. Bookmark the permalink. How much are you upsizing the baby beau? I would love to make one for my sub 1yo niece and another for my 3yo niece.